“How The Other Half Dies” cast members Betsy Willet, Grant Bale, Maria Hampton and Linda Sigismondi. “How The Other Half Dies” cast members Elaine Wheeler and Ron Siders. 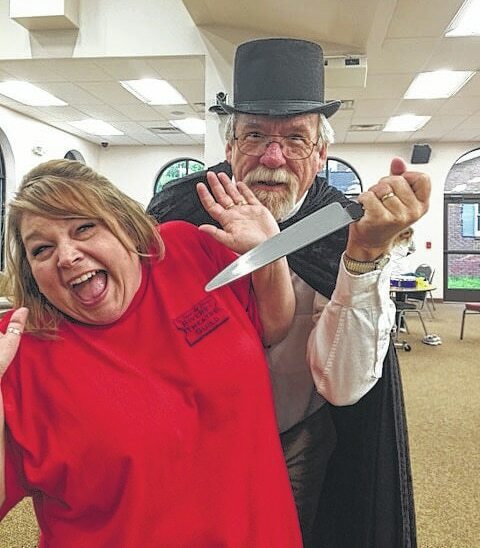 GALLIPOLIS — The French Art Colony’s Riverby Theatre Guild has two upcoming productions in rehearsals that will be staged in the Riverside Room of Bossard Memorial Library. First up for the troupe is the comedy murder-mystery, “How The Other Half Dies,” at 7 p.m. July 24 and 25, and 2 p.m. July 26. In a desperate attempt to become a member of Harriet Hammer’s posh country club, Sybil Chasteen invites Ms. Hammer to a formal dinner party on the same day that she discovers a dead body in the trunk of her new car. While Sybil waits impatiently for the authorities, the corpse, nicknamed Mr. X, sits propped up on her sofa as the list of murder suspects grows. The police, distracted by a few other cases, finally arrive only to find Sybil’s life spiraling recklessly out of control in this door-slamming, phone ringing, murder-mystery parody that includes backstage rim shots, witty one-liners and a backyard wedding. The following weekend, July 30-Aug. 1, the Riverby Theatre Guild will present the Broadway Revue, a collection of Broadway shows performed in concert style. The show will span Tony Award-winning productions from the classic era of musical theatre through today. Performances of the Broadway Revue will be 7 p.m. July 31 and Aug. 1, and 2 p.m. Aug. 2. Tickets for both productions may be purchased at the door, beginning 45 minutes prior to show time. Advance tickets may be purchased at the French Art Colony, 530 1st Ave., in Gallipolis. Seating is general admission and is not recommended for small children. General admission is $10. People who have questions should call the FAC at 740-446-3834. The productions are cast with local actors who are part of the 2015 season, sponsored by the French Art Colony, Big Country 99.5 and 93.1 the Wolf. The National Endowment for the Arts partially funded the 2015 Riverby Theatre Guild season. The French Art Colony and the Riverby Theatre Guild are supported by the Ohio Arts Council.